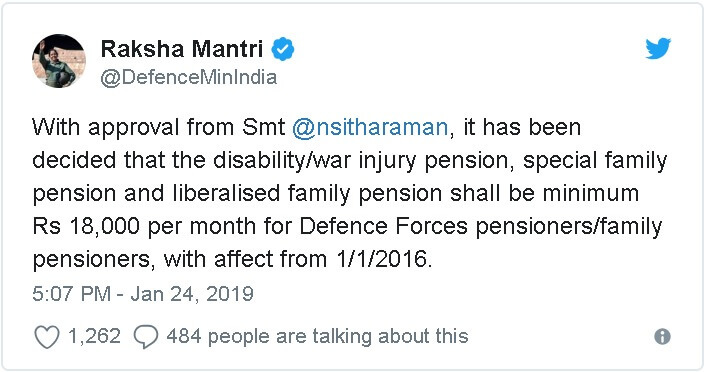 With approval from Smt @nsitharaman, it has been decided that the disability/war injury pension, special family pension and liberalised family pension shall be minimum Rs 18,000 per month for Defence Forces pensioners/family pensioners, with affect from 1/1/2016. THE MINISTER OF DEFENCE HAS TO ISSUE THE OFFICIAL NOTIFICATION FOR REFERENCE. 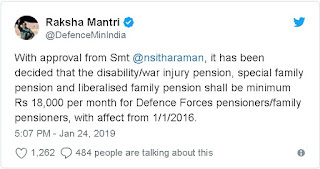 it has been decided that the disability/war injury pension, special family pension and liberalised family pension shall be minimum Rs 18,000 per month for Defence Forces pensioners/family pensioners, with affect from 1/1/2016.